Hereditary Cancer Risk Assessment - Otogenetics Corporation Inc. Inherited genetic mutations can increase a person’s risk of developing cancer through a variety of mechanisms, depending on the function of the gene. Mutations in genes that control cell growth and the repair of damaged DNA are particularly likely to be associated with increased cancer risk. The genetic mutations that cause many of the known hereditary cancer syndromes have been identified, and genetic testing can confirm whether a condition is, indeed, the result of an inherited syndrome. Genetic testing is also done to determine whether family members without obvious illness have inherited the same mutation as a family member who is known to carry a cancer-associated mutation. Until recently, most testing for cancer genetic risk involved traditional exon-by-exon Sanger sequencing of each candidate gene. 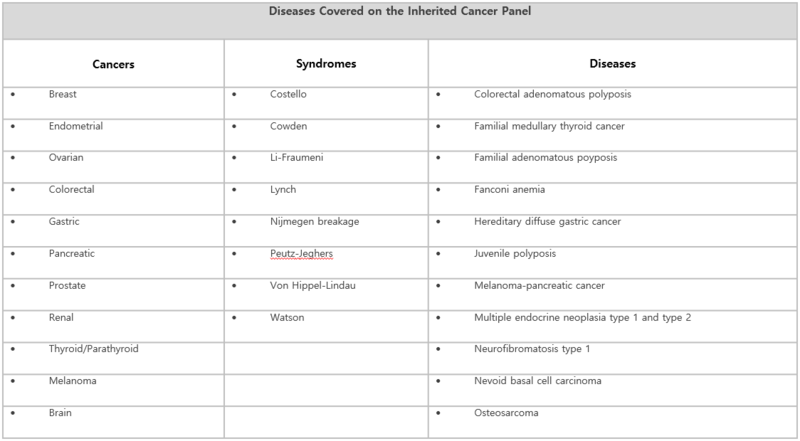 For example, individuals susceptible to hereditary cancers were screened based on personal or family history and offered testing for mutations in a single gene or a set of genes associated with a particular syndrome, for example BRCA1 and BRCA2 for hereditary breast and ovarian cancer or mismatch repair genes for Lynch syndrome. In contrast, the advent of Next Generation Sequencing allows parallel sequencing of millions of short pieces of DNA simultaneously. Prior to Next Generation Sequencing, genetic testing usually started with the most commonly involved genes and proceeded to less likely genes only when clinical suspicion was very high. However, cancer panels allow testing of all genes in parallel without substantially increasing the cost, leading to a different clinical algorithm in which all known contributing genes can be assayed at first evaluation. “Approximately 15% of all ovarian cancers are attributable to a BRCA1 or BRCA2 mutation. (MLH1, MSH2, MSH6, PMS2), and BRIP1, RAD51D, RAD51C, PALB2, BARD1, and TP53”. There are multiple genes other than BRCA1/2, which when abnormal, may elevate an individual’s susceptibility to breast cancer and other cancers. Multi-gene testing allows for the identification of 40 to 50 percent more individuals with hereditary cancer gene mutations than is possible testing for BRCA1 and BRCA2 alone. This is a highly cost-effective and time-effective method for the simultaneous evaluation of multiple genes. Testing more than one gene at a time allows for more information in a designated period of time. Some insurance coverage allows only one genetic testing per lifetime. Next Generation Sequencing with custom oligonucleotide-based target capture provides robust and clinically actionable data. Illumina sequencing of the coding regions. Analysis options include: full sequencing, common variant, Copy Number Variations referencing comprehensive clinical genetic databases. High depth coverage capable of detecting common and rare mutations. Turn Around Time of 2-3 weeks. Experience in genetic testing over 10 years. MS and PHD Scientists ensure accuracy of results. Each report is reviewed and signed off by Board Certified Clinical Molecular Geneticists. A hereditary cancer risk assessment is the key to identifying patients and families who may be at increased risk of developing certain types of cancer. Hereditary breast–ovarian cancer (HBOC) syndrome is caused by mutations in BRCA1 and BRCA2 genes and is characterized by increased risks for early-onset breast, multiple breast primaries, male breast, and epithelial ovarian, Fallopian tube, or primary peritoneal cancers. Cancers of the pancreas, prostate, and melanoma are more common in individuals with HBOC syndrome. The pathology of “triple-negative phenotype” breast cancer (estrogen receptor–negative, progesterone receptor–negative, and HER2/neu–negative) has been strongly associated with BRCA1 mutations. The likelihood of identifying a BRCA1/2 mutation in a woman with ovarian cancer at any age is around 13–18%. Of males with breast cancer, 15–20% has a BRCA1/2 mutation. The overall prevalence of BRCA1 mutations is estimated at 1 in 300. BRCA2 mutations are estimated at 1 in 800. Founder mutations in populations e.g., Ashkenazi Jewish, Icelandic, and Mexican Hispanic populations lead to increased mutation prevalence in these populations. Genetic testing should be considered for appropriate high-risk individuals where it will impact medical management of the tested individual and/or their at-risk family members. The probability of a mutation being detected based on these criteria will vary depending family structure. Individuals with unknown or limited family history, such as fewer than 2 female first- or second-degree relatives having lived beyond 45 years in either lineage, may have an underestimated probability of familial mutation detection. The likelihood of detecting a mutation may be very low in families with a large number of unaffected female relatives. Patients who have received an allogeneic bone marrow transplant should not have molecular genetic testing with current technologies using blood samples due to unreliable test results from contamination by donor DNA. DNA extracted from a fibroblast culture can be used. If not available, then a buccal sample can be considered with understanding of the risk of donor DNA contamination. A family member with the youngest age at diagnosis, bilateral disease, multiple primary cancers, or other cancers associated with the syndrome. If there are no living family members with cancer related to the syndrome in question, then consider testing first- or second-degree family members affected with other cancers thought to be related to the gene in question. Testing of unaffected family members when no affected member is available should be considered. The significant limitations of interpretation of test results should be discussed with the patient. If no mutation is found, consider other hereditary cancer syndromes associated with breast and ovarian cancer risk for which genetic testing is clinically available. Testing family members for Variants of Unknown Significance, VUS should not be used for clinical purposes. Referral to research studies that aim to define the clinical impact of classification of such variants through clinical laboratories or registries. Individuals with a family history of three or more cases of breast, ovarian, pancreatic, and/or aggressive prostate cancer (Gleason score ≥7) should also be referred. Note that this should not include families in which all three cases are aggressive prostate cancer. Advise about possible inherited cancer risk to relatives, their options for risk assessment and management. For patients of reproductive age, options for prenatal diagnosis, assisted reproduction and pre-implantation genetic diagnosis should be discussed. Variant classification is based on a Mendelian perspective and employs the recommended five-tier classification system recommended by the American College of Medical Genetics, ACMG. This result means that a mutation or a genetic change that increases the lifetime chance of developing certain cancers was identified. This variant directly contributes to the risk of developing cancer. Some pathogenic variants may not be fully penetrant. In the case of recessive conditions, a single pathogenic variant may not be sufficient to cause disease on its own. Additional evidence is not expected to alter the classification of this variant. The final report contains detailed risk information specific to the mutation(s). This result does not mean that the patient has cancer or will definitely develop cancer in their lifetime. Follow up with physicians, healthcare providers and genetic counseling is recommended. The result means that a mutation or a genetic change that is likely to increase the lifetime chance of developing certain cancers was identified. However current scientific evidence is insufficient to prove this conclusively. Additional evidence is expected to confirm this assertion of pathogenicity, but we cannot fully rule out the possibility that new evidence may demonstrate that this variant has little or no clinical significance. The final report contains detailed risk information specific to the mutation identified. This result does not mean that the patient has cancer or will definitely develop cancer in their lifetime. Follow up with physicians, healthcare providers and genetic counseling is recommended. Variant(s) of Unknown Significance (VUS) are variants that do not fit into pathogenic, likely pathogenic, or benign classifications according to ACMG and/or other relevant Professional standards, or the criteria for pathogenic or likely pathogenic and benign are contradictory for the variant. There is not enough information at this time to support a more definitive classification of this variant on cancer risk. The variant identified is not expected to have a major effect on disease; however the scientific evidence is currently insufficient to prove this conclusively. Additional evidence is expected to confirm this assertion, but we cannot fully rule out the possibility that new evidence may demonstrate that this variant can contribute to an increased risk. The result means that no variant or genetic change known to be associated with or predicted to be associated with, based on current knowledge and test methods, disease(s) was identified. No known pathogenic variant(s) was identified. A benign variant does not cause disease. Test evaluation was inconclusive. Possible reasons are not enough DNA present in test sample, sample failed quality assurance measures. A new sample submission is recommended.